Lately, I’ve been mentioning mindmapping more and more often as students wonder how to figure out if they’re original enough, or how to figure out if they’ve created a stable enough grounding in the relevant literature. I teach it sometimes as a way to build good searches with useful terms, but this is different. Sometimes the student has a clear question in mind, and we can draw in supporting bodies of research. Sometimes the student doesn’t have a clear question in mind yet, and we can draw in the supporting topics first — the things where they say “I’m kind of interested in x and y and want to see if they’re connected with z,” and then fill in the spaces between the topics to find the question. After a session this morning, I’ve realized that I teach four distinct forms of mindmapping to move students from the very preliminary topic questing through to the production of the final product. For the early stages in topic selection, students often have vague ideas about topics but haven’t yet come to a point where they’re able to say what piece of the topic they’re going to concentrate on. They know they want to do something with the implications of fictional characters’ names, for example, but haven’t really figured out exactly what about the names to pursue or maybe even what fiction to use as foundational examples. But they’re really interested in race and culture, and they know that fictional characters have names chosen for them by authors, so there’s got to be something they can do that combines the two. For this, some students find it very helpful to keep their broad topic in mind while reading/skimming several readings. 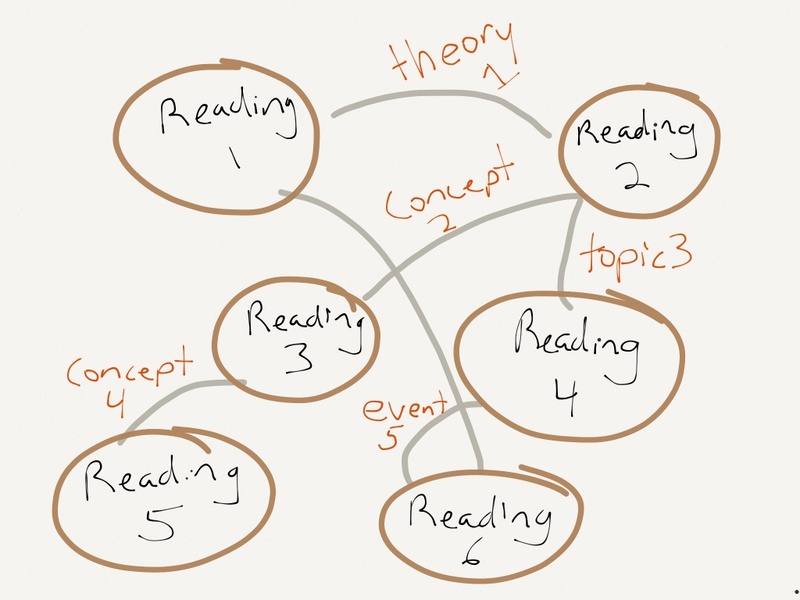 Each reading becomes a node, potentially related to other readings, but not necessarily. The students can then draw connections between readings, using this process to discover the concepts that may be key to their own work. Another tricky part of early stage research, particularly in the humanities, is learning the vocabulary of your topic and learning what counts as evidence to the community of inquiry that you’re planning to enter. 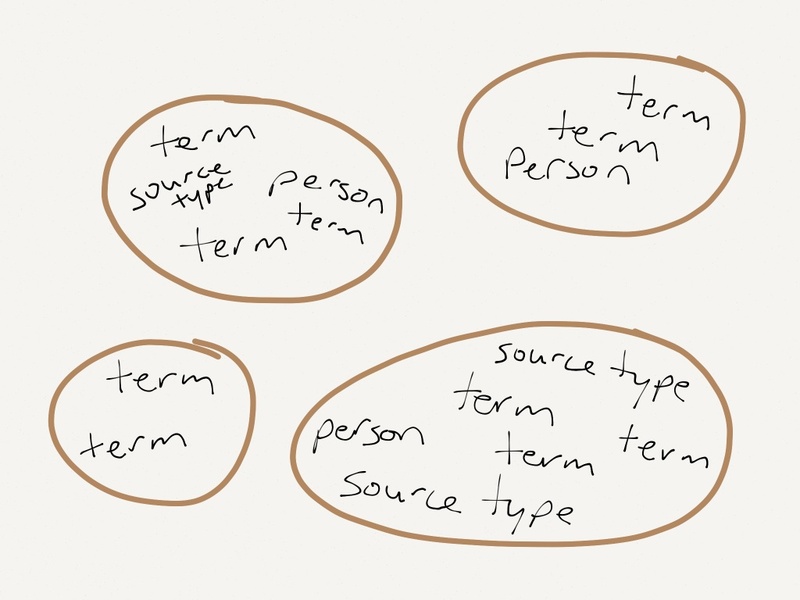 Unless you do these things, searching can be pretty impossible since it’s just term matching. If you’re using “self-concept” and your community of inquiry is using “identity” you’ll never retrieve the sources you need. Similarly, if you produce an argument based on evidence that your community scoffs at, or if you need ideas for what kinds of sources would help you make explore your topic, watching what kinds of evidence show up in the literature can be a great strategy. And of course, following up on people or institutions mentioned in the literature is another great way to build future searches based on readings you’ve found. So for this kind of map, I have students think about their major concepts, and then fill in those concepts with terms, source type ideas, and people/institutions associated with that concept. These all become fodder for future searches. Once students have solidified the core concepts of their work a bit more, they still need to figure out how to assimilate the source material into something that original rather than duplicating others’ work or simply patching together quotes from here and there. 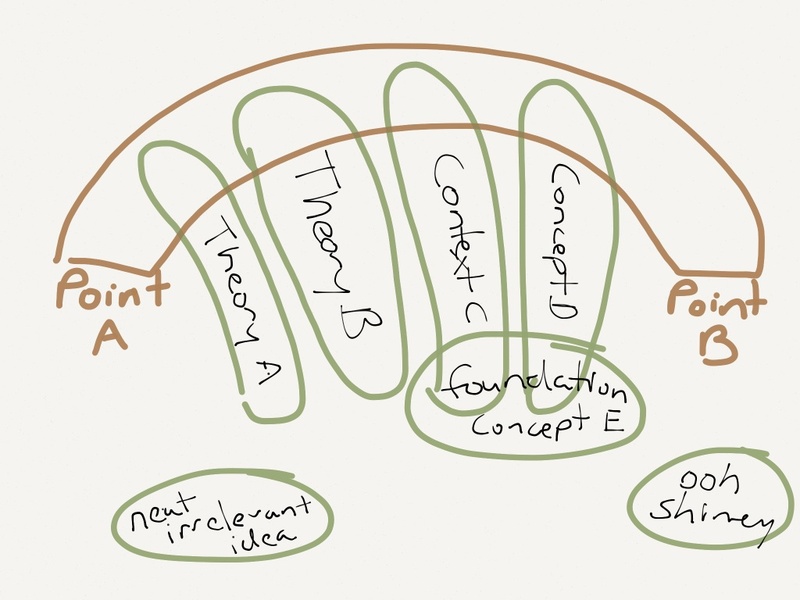 For this, a pretty traditional mindmap can help. Each of these concepts contributes a bit of itself to the students’ goals, forming one of the planks in the bridge the student is building. It’s also a way to think about potentially interesting ideas that aren’t actually necessary to the paper. Generally, if I’m working with students in a class setting or in my office, we do one of these types of mindmaps and we do it using whiteboards. Low-tech and potentially messy, but it gets the point across. 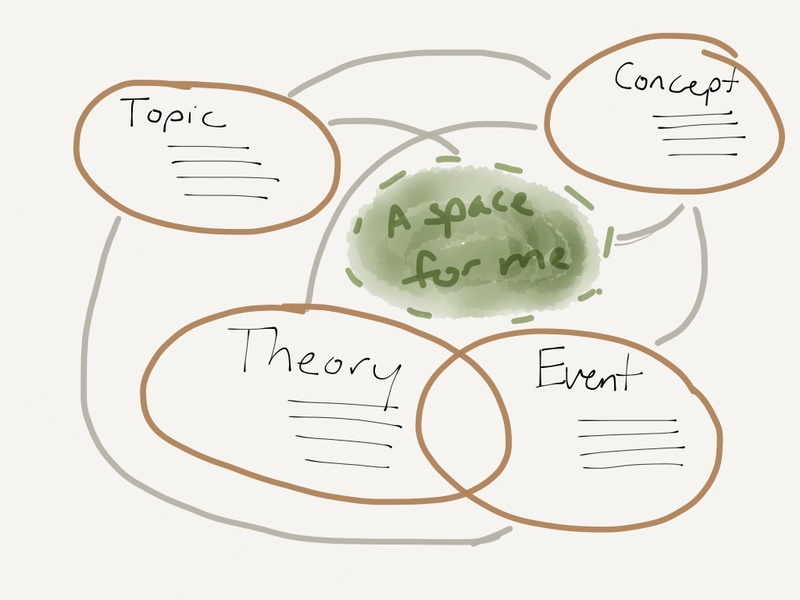 If I’m doing a long project (where I know the map will get pretty big and where I’ll probably be rearranging nodes as my thinking becomes more nuanced and clearer), I use MindNode. * Over the years, these meetings have grown from being (literally) introductions to the catalog and one major database in their field to being highly collaborative sessions where each of us brings our own expertise to the project of finding an interesting, original, and researchable topic. What a relief! There was nothing more demoralizing than covering such basics with thesis students. I’ve included this post in a Bitly bundle for an ACRL Roundtable Discussion on research formulation. Thank you for writing it! You give a great overview of concept mapping and the different ways it can be used at various stages in the research process. I am curious to learn a bit more about the types of sessions you hold with thesis-writing students. I do a similar thing here every fall with our senior students working on original research, and as you mentioned in your asterisk note, teaching them basic tools and reminding them of basic library resources/services is so demoralizing for everyone involved. Any info you can share about what you do with your students would be a great help! What I was talking about in that footnote was individual research consultations with thesis-writing seniors, so there’s quite a lot of variability depending on the student and the topic and how far along the research is. We often start discussion where the student is in the research process, what interests him/her about it, what his/her major points are, and how this contributes the field. Typically, these questions end up in fairly long conversations with some literature searching in the middle and often some concept mapping, because almost nobody can answer those questions before the research and writing are pretty far along. But that kind of conversation now forms the basis of my upper level consultations. Depending on the topic, students might need an introduction to a new tool or new method of searching, and sometimes what it really takes is both of us working on our own computers and saying “Hey, here’s a term I’d never have thought of,” and “have you heard of this researcher?” at each other until we find a foothold in an unfamiliar area. What have you done? I’m always looking for good ideas!